Preheat oven to 180°C. Place the butter, icing sugar, and vanilla in the bowl of an electric mixer and beat for 5–6 minutes or until light and fluffy. Add the flours and beat until combined. Place the mixture into a piping bag fitted with a 1.5cm plain nozzle and pipe 10 x 4cm rounds onto baking trays lined with non-stick baking paper. Cook for 6 minutes or until golden. Allow to stand for 5 minutes, then transfer to a wire rack to cool completely. To make the buttercream, place the butter in the bowl of an electric mixer and beat for 4–5 minute or until pale and creamy. Add the icing sugar and beat for 5–6 minutes or until pale and fluffy. Add the passionfruit curd and beat for a further 1 minute or until just combined. Spoon buttercream onto half the biscuits and sandwich with the remaining biscuits. Makes 16. 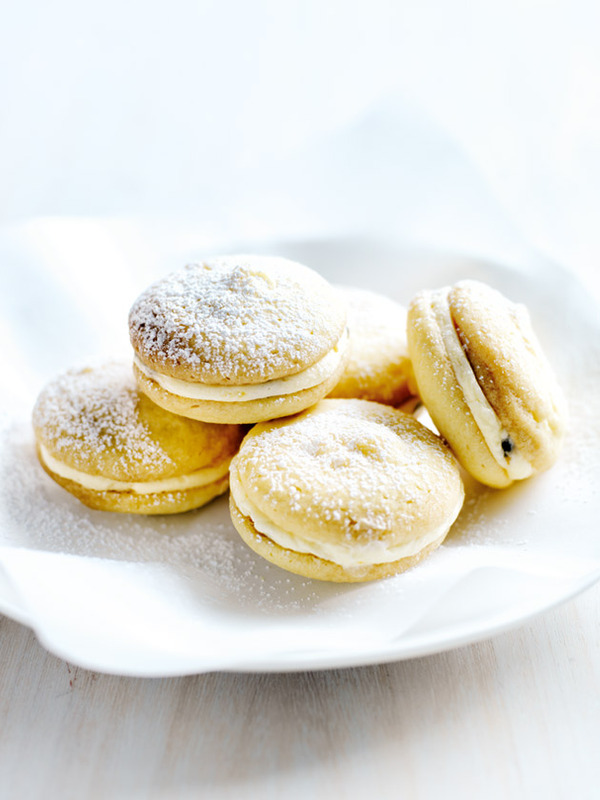 + You can make your own passionfruit curd with our recipe here.